Created by Joanna Espinel, a self-proclaimed vegan with a sweet tooth, Delish vegan doughnuts are so popular that they sell out every day – top tip: get there early or reserve them online several days in advance! The toppings change regularly – I was there yesterday and there were 12 varieties on offer. all of which looked delectable. For once I didn’t mind queueing for a few minutes, as I needed a moment to decide. They all look sinful, like you would need to go to confession after eating them. Eventually I plumped for intense chocolate with smoked sea salt and pistachios because I’m sophisticated me, although not quite sophisticated enough for the brunch doughnut, a savoury concoction filled with (vegan) cream cheese. Actually, I would consider it in the future, because it looked really good, but I had just had lunch and was after some dessert. My only buyer’s regret was not buying one of each – definitely worth a few Hail Mary’s! Other flavours included the raspberry “Homer”, blackberry chocolate, and a classic glazed doughnut. The stuffed hole-less varieties, known as “Berliners” in Spain, featured a gingerbread cream one, arroz con leche (rice pudding with cinnamon), banana and peanut and Boston cream. 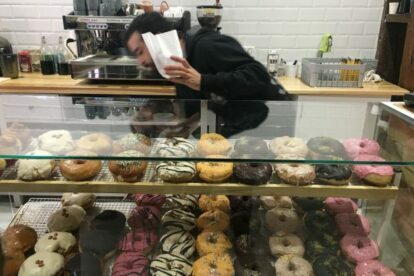 Warning: they are huge – doughnuts on steroids!